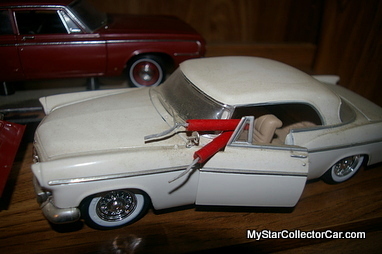 One of my fondest memories of Christmas past was the toy cars, so half my Santa Claus stuff at Christmas had wheels. If it wasn’t for a brutally practical set of parents, the other half of Christmas presents would have been more cars and no new clothes. You never really outgrow that addiction to all things scale-size so the Christmas season drives the point home. 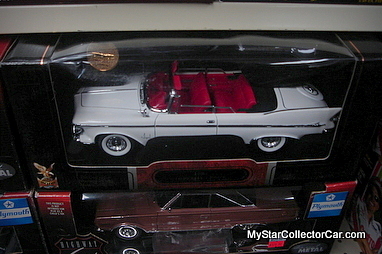 Jim and I shared a few of the scale model service stations at Christmas and a few slot car tracks but one year he got a remote-controlled (via an attached cord) ‘64 Cadillac convertible with working headlights, horn and steering. I got a ’63 Corvette split window that didn’t steer but it was a hell of a lot faster. That Vette satisfied my mandate as a kid was simple-own everything cool. 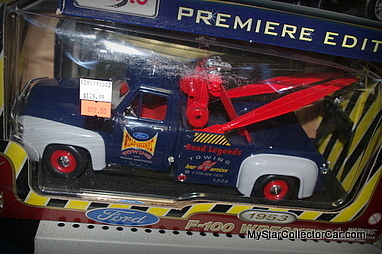 My models ranged from the Munster-mobile to ’56 Ford trucks and the Little Red Wagon. 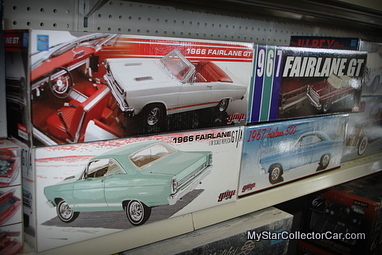 These were all products of what was cool for a kid in the mid-60s but one of my fondest dreams was to find a model car just like the one Dad drove in real life. Unfortunately, he drove bare-bones Plymouth 4-door sedans so that never happened but it did turn me into a seeker of the unusual and off-the-beaten path stuff. 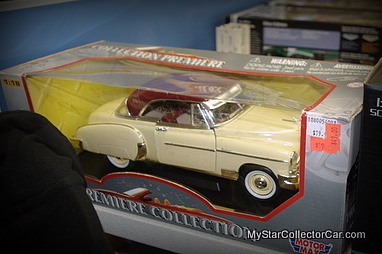 The model car game has changed so you’ll find completely assembled classics on the shelf. 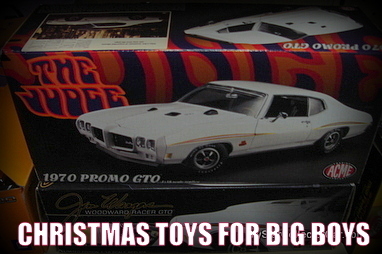 The model car world is huge, varied and far-flung in 2013 so Christmas is magic again for recovering toy car guy addicts likes me. I like hanging out in hobby shops during the car show off-season and once the security guys get used to me, I get to check out a lot of unique stuff. 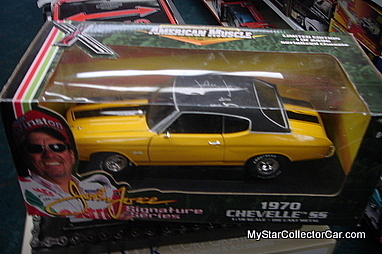 You simply can’t say “I’ll be in and out this car hobby store in five minutes” if you have even a molecule of car guy blood in your system.This is world that draws you in like a black hole in space because they have so many cool models on the shelf. One of the key phrases in car model world is ‘limited edition’. These low-run models can trigger an online fistfight in cyber-bidding world. 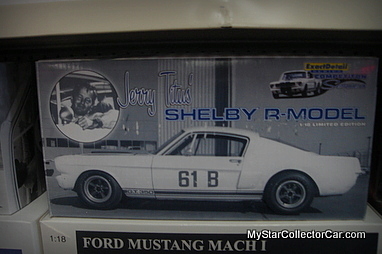 A good example is this Jerry Titus Shelby R Mustang because they only built 2496 of them. This is an arena where an expert opinion is invaluable because I see tidal waves of cool on the shelves, but I don’t know anything about the scale model game itself. Bob Rechlo owns Gold Eagle Gifts and Collectibles and he understands the business side of the equation. Bob explained how the names change in this game, “Ertl bought American Muscle so they handle their stuff now but they used to just make farm stuff”. The other big issue is quality because there are entry-level models with basic details and there are upper-end models with a lot more as Bob outlined, “ They can come with roll-down windows gas lines and brake lines. It can get pretty crazy. ACME is one the top-end builders”. The other part of the equation is licensing as Bob added,”The molds are really expensive so that adds to the cost”. 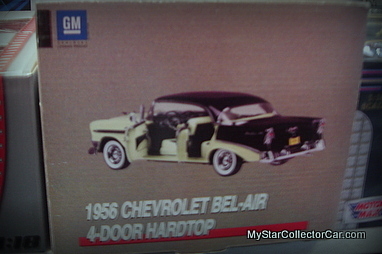 Back then, my Christmas model car adventures centered around 1:24 scale models but now they can range from 1:76 to 1:12 so it really comes down to cost, detail and how much space your wife allots for what she calls your “toy cars”. 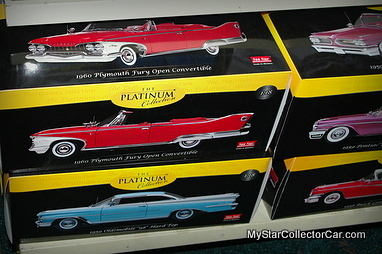 Back in the day, you had limited options for die cast cars and a lot of them had the name Corgi, Matchbox or Dinky Toys. 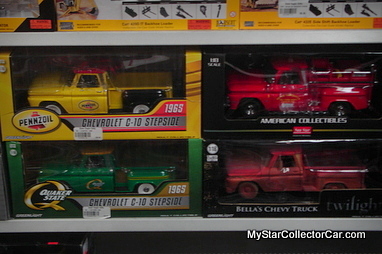 Corgi was good because we learned a lot about British iron and Matchbox toys were the perfect stocking stuffer. Many of these little die cast toys were destined to be cannon fodder for spectacular firecracker explosions back in the far less bubble-wrapped world of the 1960s but that would be foolhardy in 2013. 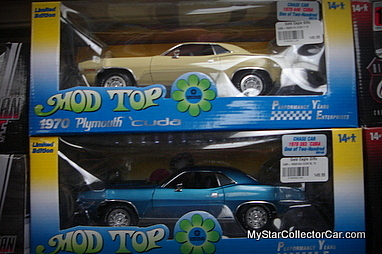 Bob explained this with an example, “These two limited edition mod- top ’70 Cudas are two of only 200 ever made”. Somehow, the idea of sticking a boatload of firecrackers into something that rare defies logic, but my inner 11-year-old kid would have done it in a heartbeat. There might have been an upside to the firecracker scenario because distressed looking models in barn find condition are big money in today’s world. 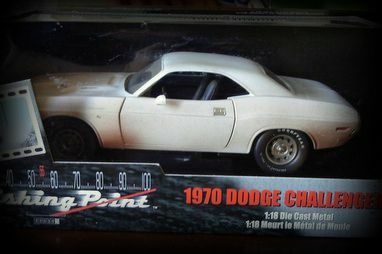 Bob explained how the dusty, dented version of the Vanishing Point ’70 Challenger has exploded in value over the years. We could have converted it to the “after it hit the bulldozer” look back in the 60s with some well-placed blockbuster firecrackers. Any hobby that lasts a lifetime is a full-scale addiction and with any addiction the tendency is to exhibit excess. Some guys dedicate whole rooms to hundreds of models while others split them up in the inevitable divorce settlement. Bob buys models for a living and he explained the logistics behind this massive inventory, “You should see my garage, trailer and storage unit-in fact,I’m going to need another storage unit”. Fear not if you’re looking at Christmas toys for big boys because Bob needs the space. Bob owns Gold Eagle Gifts and Collectibles.